The 0719-3701-99 is a 0737-0604-99 narrow-range electrolytic tilt sensor encapsulated with cement in an aluminum channel. It utilizes high quality glass and platinum to provide extremely high accuracy tilt measurement over a narrow angle range. The encapsulation allows for simpler mounting and better performance over temperature. 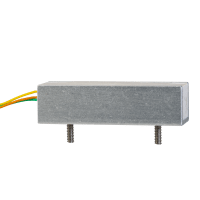 This sensor can be paired with any of our signal conditioners to provide a digital or analog output proportional to angular position.